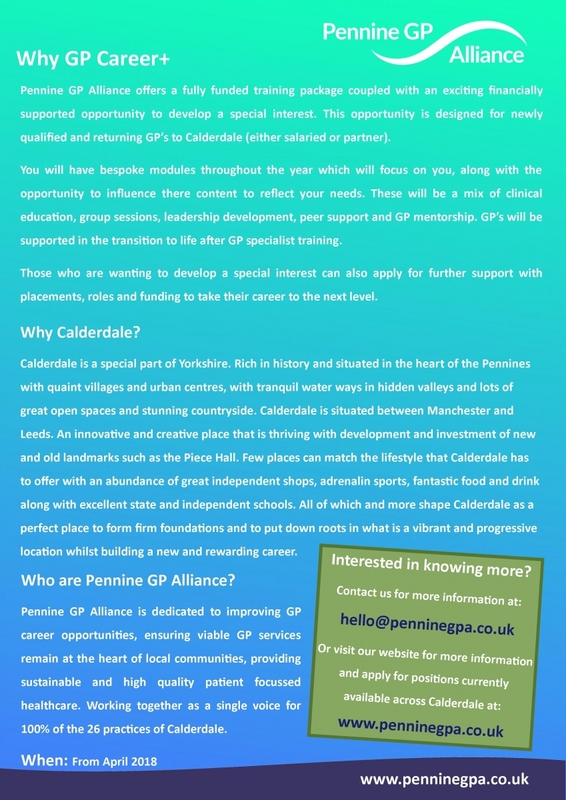 Pennine GP Alliance is the Improving Access service provider for Calderdale. This service provides registered patients with improved access to GP services 365 days a year. If you are a GP, Nurse, Health Care Assistant or Pharmacist and wish to work in one of our hubs please contact us at: hello@penninegpa.co.uk for more information. Longroyde Surgery is a friendly, small, single site, SystmOne practice with 4,400 patients. We are looking for a salaried GP with a view to partnership, with up to 5 sessions available per week. Close-knit, friendly and helpful team of reception and administrative staff. 6 weeks annual leave, pro rata. Competitive salary, study leave entitlement and indemnity paid, in line with standard BMA model salaried contract. To register interest contact Practice Manager Joanne Kellett or send a CV and covering letter. We are a close knit, friendly team of 3 partners, 4 sessional GP’s, 1 registrar, 3 ANP’s, 1 advanced clinical Pharmacist and a fantastic nursing team of 5. We have a strong track record of staff retention and the current vacancy is to replace 2 retiring ANP’s. We are seeking a motivated and committed team player to join our long established high achieving practice. We provide an extremely supportive work environment and are keen to support any outside interest along with generous CPD time. We are currently collaborating with 11 other local GP practices in Calderdale with the potential to becoming a “Super Practice”. We have access to financial support to our new sessional GP’s to help support training via our local federation. We offer a 6 -12 month’s mentorship for newly qualified GP’s. In return we offer a competitive salary, with 6 months mutual assessment for salaried to partner. We will consider job share and are very supportive of work/life balance. Are you a highly motivated and committed GP who’s looking to become part of dedicated team of health professionals? Hebden Bridge Group Practice is a large, dynamic training Practice on three sites serving 19,000 patients. In addition, we are committed to Calderdale GP Career Plus- a fully funded training package coupled with a supported opportunity to develop a special interest. 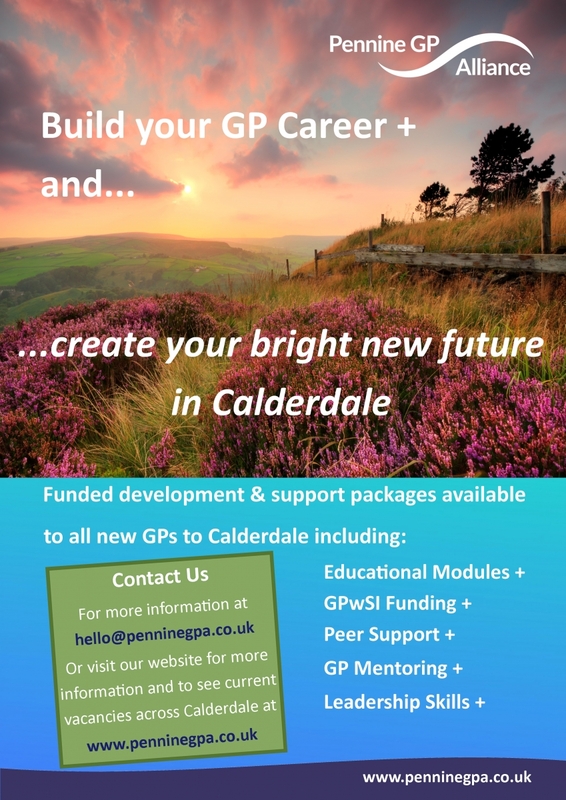 Provided by Pennine GP Alliance, it’s designed for newly qualified GPs and GPs returning to Calderdale. The scheme includes clinical education, peer support and GP mentoring. We offer excellent career opportunities for the right candidates. For further information and informal discussion, please contact -Tony Martin, Practice Business Manager or Dr David Burley on 01422 841204. Submit your CV and covering letter to tony.martin4@nhs.net or Tony Martin, Practice Business Manager, Hebden Bridge Group Practice, Valley Medical Centre, Valley Road, Hebden Bridge, HX7 7BZ. We are looking for an enthusiastic, motivated and forward thinking GP to join our team. We are a GMS practice with a very committed and organised team of clinical and non-clinical staff. We offer a variety of enhanced services to our patients. Excellent location for anyone looking to commute with train station a short walk from the practice and close proximity to M62 for Leeds / Manchester. Informal enquiries can be made to the Practice Manager by ringing 01484 715324 We would accommodate informal visits prior to application. Visits by prior arrangement only please.